they're quite the hit at parties! well, as long as I spell everyone's name right. 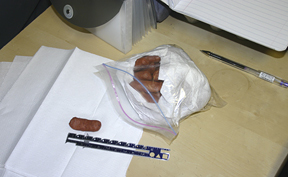 first, I dried a bag of little sausages. if you don't dry them first, you'll get bubbles as you etch. water seriously impacts the burn. 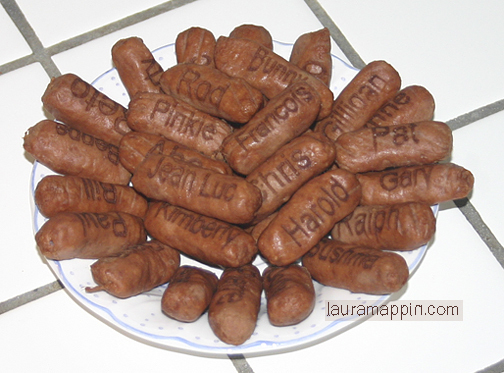 I didn't just dry the outside, I wrapped each sausage in a couple layers of paper towel and squeezed it without breaking it open. see the material science just waiting to be learned! 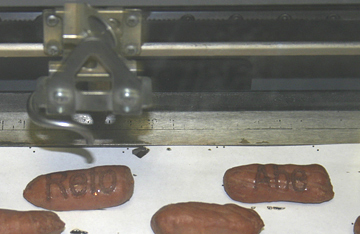 then, I made a quick jig to place the sausages in the laser so I could etch many at once and actually finish in my reserved time. I measured a sausage with my trusty 6-inch hem gauge which I always travel with. 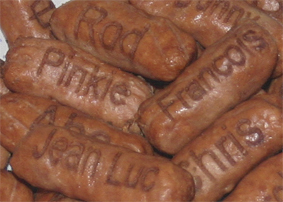 the first time I did this I learned I'd picked one of the smallest sausages and so I had to tweak my process later. 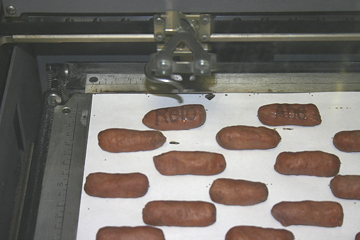 I placed an 11x17 piece of paper on the laser table to hold the sausages. I made laser marks on the paper to tell me where to place the sausages. then I used the same digital file to position and size the names. so, in CorelDraw, I built a rectangle 2 inches wide by 3/4 inch high to match what I thought was every sausage's dimensions. I added two very tiny circles in the upper left and right of that rectangle, grouped it all together and replicated it across my 11x17 workspace, putting the rectangles anywhere. they don't have to be aligned with each other. a very nice quick way to build a jig for many purposes. I chose just the circles and had the laser cut them out. 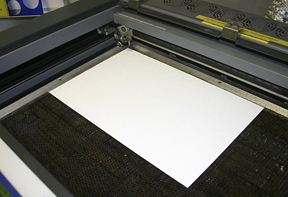 this would be faster than etching anything across this large area. 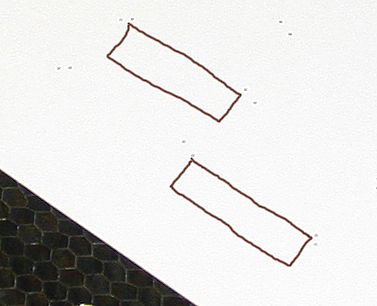 the image above shows the laser cut circles with two of the many rectangles photoshopped in to give you an idea. 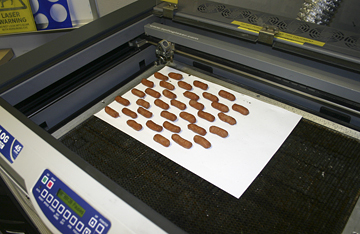 then I laid out the sausages on the paper lined up with the tiny holes. I was planning on lining them up more densely than this but since I'd unknowingly chosen the smallest sausage on which to build my jig, I had to improvise. I used every other rectangle so that it was easy to remember a pattern to then build out the names. I filled every other rectangle with an appropriately sized name and sent just the names to the laser. these are getting etched. you can see a bit of light coming off the first sausage. they're also still showing signs of moisture but it's subtle enough to still allow the words to be readable. harvest them and get thee to a party!! This page contains a single entry by laura published on March 28, 2009 10:36 AM. wanna knot? was the previous entry in this blog. camo apron is the next entry in this blog.